Technical Support is available for this toolset and other SEO site management software applications. We design, develop, and implement custom online software solutions, employing industry-standard systems architecture with high-performance operating environments to create a unique online presence for your site. Experienced internet engineers combine both technical skills with extensive knowledge of the internet to deliver comprehensive, high-quality solutions that are designed to meet your needs in the dynamic online world. Your questions are answered by email and instant messenger. Hourly and monthly contracts are available. Speak live by telephone with a software engineer for installation and configuration support. Hourly and monthly rates are available. 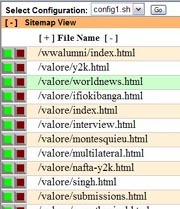 Add new features and integrate this SEO sitemap optimization toolset with other site management applications. Project quotes and hourly rates are available. Develop your site with customized design and interactive features. Project quotes and hourly rates are available. * Based on 100 hours per month. This SEO sitemap optimization toolset is an open source project that is freely available for use in web server site management. Donations are welcomed for continued development of this project through the project page on SourceForge.net or through our web site. Please show your support for this open source project by visiting the sponsor links displayed on this page.